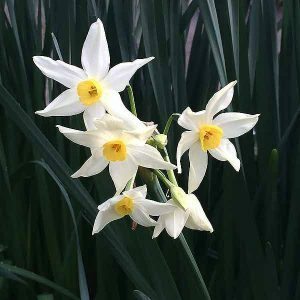 Early flowering Jonquils are one of the toughest bulbs for Australian conditions. They flower most reliably and require little care. A number of varieties are available for sale and are best purchased in early autumn. Jonquils are known as ‘Tazettas’ in botanical terms, and come in a wide range of colors many with perfumed flowers. They grow well through most of Australia except in the more tropical zones. These are colorful and fragrant spring flowering bulb that do well in warmer climates as well as cooler areas..
Erlicheer is one of the best known varieties and has long lasting double flowers, as its name suggests this is an early to mid season flowering variety. Creamy yellow fragrant flowers. Grand Soleil d’Or is another classic variety, clusters of fragrant yellow flowers with bright orange centres, plus a lovely fragrance. If you are looking for large flowers in a Jonquil then you can’t go past Highfield Beauty simply the biggest flowers of all pale yellow with pale orange cups and fragrant as well. For white flowering varieties try Paper White or Silver Chimes. And for a late season variety try Jaune e Merville, primrose cream with a lemon cup. A sunny position in a well drained soil is about all they require. You will find old established clumps flowering well that have been neglected for years. They do like a cool soil especially from autumn to spring. 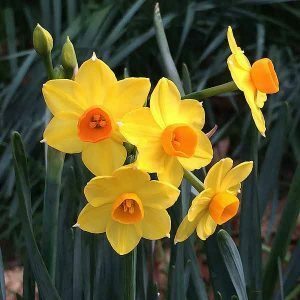 Jonquil bulbs are best planted in early autumn. Water when planting, jonquils will require supplementary water only in a dry winter or spring. Plant bulbs around 10cm deep. Fertilize by top dressing after the flowers have faded. Plant in full sun to part shade, jonquils work well beneath deciduous trees. Leave foliage to die back after flowering as this returns energy to the bulbs for the next season. Divide when needed during late summer to autumn. Jonquils do not need to be lifted every year, just when dividing larger clumps. Pearl Clusters is a Jonquil with pure white fragrant flowers. Egg and Bacon has double cream flower clusters with yellow centres. Geranium has nice clusters of white flowers orange centres.